The “sustainable growth” ideologues don’t have just one S-curve, of course; they have a whole series of them, each leaping further up just as the one before it peaks. Both the S-curve and hype cycle are cyclical, but both euphorically ultimately trend generally upwards. So in essence they aren’t “cycles” at all, but spirals. Anyone who studies nature knows that nothing grows forever (even though our Ponzi scheme stock markets are utterly based on the assumption that things can and will), so all spirals are, in effect, death spirals. Nature is however replete with cycles which, over time, wax and wane, advancing over time, if “advancing” is the right word, sideways. Overlapping cycles, cycles embedded in other cycles, smaller and larger and longer and shorter cycles. All of them ending up, finally, back where they started, at zero. And anyone who has followed the hype cycles over time has quickly discovered that almost nothing ever reaches the “plateau of productivity” except in the minds of those selling it. Emergence is an inherently complex-system construct. Rather than trying to “create” communities, what this model does is acknowledge pioneering efforts, then name them, in ways that others self-identify with, allowing these pioneers to coalesce and connect into networks. Networks are by definition loose affiliations, with members joining and leaving easily. 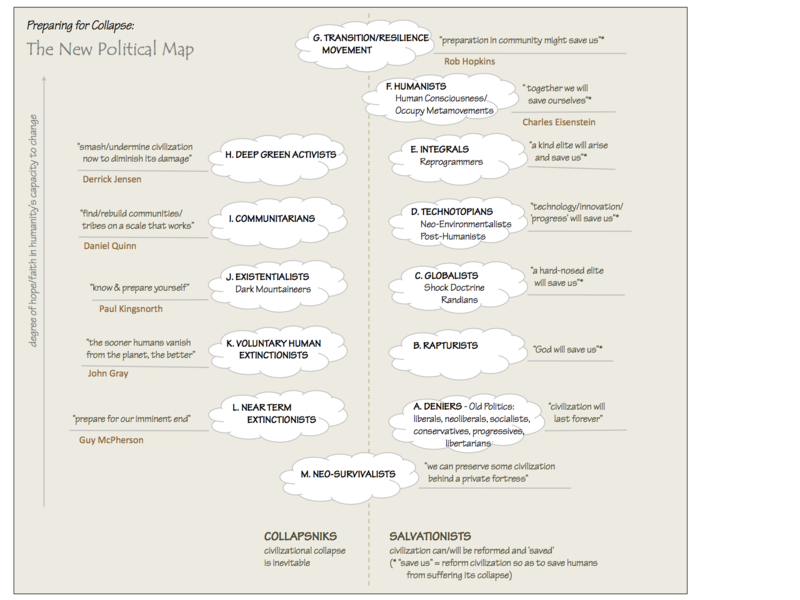 The next step is to nourish these networks so that they become cohesive, more integral and helpful to their members. At this point they evolve into true communities of practice. The term ‘community of practice’ has been severely misused in business to represent groups of professionals assigned to focus on certain specialties — in this sense they are neither ‘communities’ nor ‘practitioners’. True communities of practice are self-organized, powerfully supportive of each other, highly committed to their shared values and learning, and ‘practice’ in the real sense of constantly learning by doing and by collaborating with each other. Once you have a true community of practice, the final step is to propagate its value by illuminating, spreading the word through stories, events, word-of-mouth and publications about what they do and why it’s important and useful. Through this the collective value of the practitioners is realized as they become a system of influence — with the power and resources to bring about important and positive change. These actions of naming, connecting, nourishing and illuminating are part of the arts of hosting and facilitation. These arts are perhaps the only kind of change work that actually works in today’s complex environments, which is why I have so often spoken so highly of the importance of them. The four actions are part of the practice of ‘holding the field’, encouraging and enabling and keeping open the vital ‘field’ of people and relationships that traverse this lifecycle. This field is a field of energy (the vertical axis of the above chart is, in effect, the degree of collective energy at each stage of the lifecycle). What do you think of this model? I found it intuitively powerful and compelling, particularly as Chris sketched it out and explained it. I like the idea of energy fields and the important work of moving and channeling that energy in productive ways. It ties into the ‘sweet spot’ concept in my book — the high-energy intersection of passion, exceptional competency and deep human need. 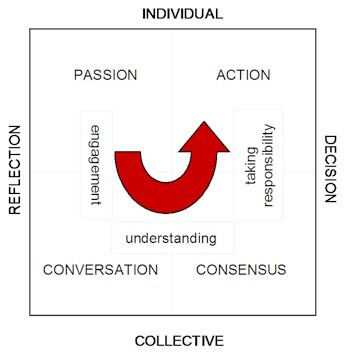 I like this model because it recognizes that decisions and actions start with individual initiative and end with individual responsibility — it is through the intermediate collective stages of conversation, understanding and consensus that the wisdom is obtained to know what to do, but ultimately, what gets done is the sum of motivated individual actions. What I’m trying to figure out now is how the dynamic of the collective decision-making model works within the larger emergence lifecycle model. They’re both about individual and collective energy, one at a micro level and the other at the macro level, and how those energies move in time and space. It’s a bit new-agey, sure, but the old models were too static and simplistic and hierarchical. At least these recognize and draw on human passion, curiosity, energy, responsibility, self-organization, self-management, and propensity for relationship and collaboration. Is this useful? What’s it missing? Given that we’re all in so many networks, how could we apply this model to make better use of our time, our relationships and our collective energies? How can we ‘hold the field’ even more effectively? Very interesting perspectives here and a good summary of things. I can see myself using this to explain things to my director! Consensus does not mean that everybody have to agree to 100%. The process leading to a consensus would be like this. Begin with some time for reflection. To start with ask everyone if they understand why we´re going to make the decision, to secure that they understand the context. Next question is if they feel that they have been listening to, if the group have been listening to them and understand their remarks. The third q is if they believe that they have understand the others opinions and arguments. The last q is if you can stand behind the decision and take responsibility for it (even if you to start with have had a different opinion). I really think this is a great explanation what is going on within individuals and in teams when they are going to interact, make decisions and take common responsibility for implementation. Compared with your model makes it even better!